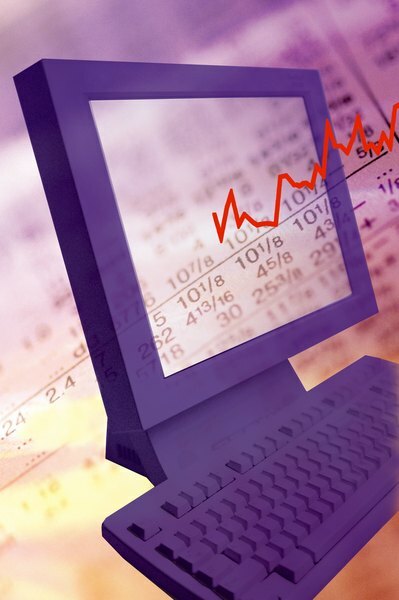 Professional traders use charts and technical analysis to understand a commodity's price behavior. Charting prices on a daily basis is one way you can learn about how a commodity behaves in the marketplace. Most commodities are cyclical and you can look at a chart to find repetitive price patterns, get a sense of changes in a commodity’s supply and demand and determine where to place profit and loss stops. Understanding the information contained in the chart can help you develop a more profitable trading strategy. Decide which charting program you want to use. If you have an online trading account, your broker should provide free charting software, or you can also find free charts on the Web. Find and review the list of commodity asset groups. Select an asset group and click on the link to go directly to the list of available products within the asset group. For example, if you want to trade gold, you would select "Metals" from the asset group then click on "Gold." Look at the available contract delivery dates. Find the chart icon for the delivery date you select and click on it. If you select the most recent delivery date, the chart should be interactive. Select which time period you want the chart to display. For example, you can use a one minute, two minute, five minute, 10 minute, 30 minute, hourly or daily time frame. Decide if you want to use candlesticks, point and figure, or bars to display the commodity prices. Add technical indicators to better visualize the commodity’s price behavior. For example, Bollinger bands identify a trend by putting an upper and lower band around the prices. These bands expand as volatility increases and contract as volatility falls. The Relative Strength Index measures if a commodity is oversold or overbought. The Moving Average Convergence/Divergence gives buy or sell signals based on the moving average lines trending up or down. Use the information displayed on the chart to help you determine if you should open a trade or sit on the sidelines and wait for a better opportunity. Use the charting website’s educational material to learn more about different charting indicators and what they mean. Commodity charts only tell part of the price movement story. Pay attention to news releases and government crop reports that may indicate a change in supply and demand. Chartpatterns.com: Do You Know These Chart Patterns?